Occasionally I have reason to remove my panniers and trunk bag from the back of my trike. It is only for a short temporary time. And when they are removed I usually lift the trike up and am always amazed at how much lighter it is. 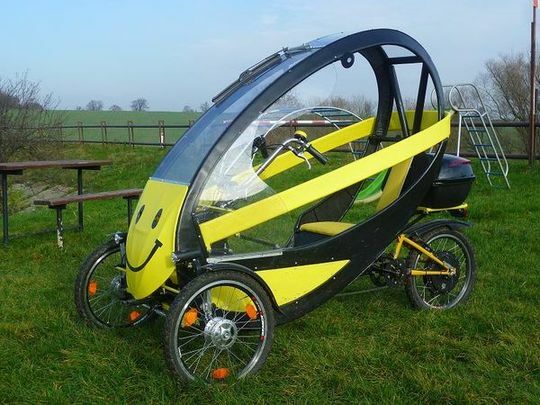 It seems like it is an altogether different trike. And I have to admit that it would be nice to ride it with all that extra weight missing. I think my extra stuff I haul around weighs in at about 30 pounds. And that is only what is inside the bags. It is not counting all the other stuff I have added to the trike. My 34 pound trike probably ends up around 70 pounds or more. That is more than double it’s original weight. Oh yes, the Schwalbe Marathon Plus tires are heavier than the Marathon Racers that came on it so that is even more weight. Then there is my fat carcass I am hauling around. Now we are talking about some serious weight. I mean it is a wonder it even moves. Pedaling uphill is when it is all really noticeable. Of course, going downhill I readily out accelerate most others. 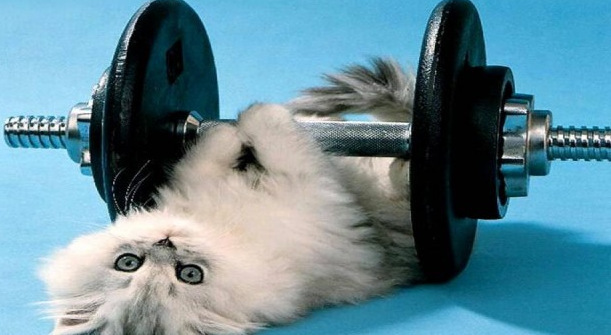 That is the only time that extra weight pays off. Yes, it would be nice if most all of this weight didn’t exist, but with the exception of my excess body weight the rest of it I would not want to ride without. 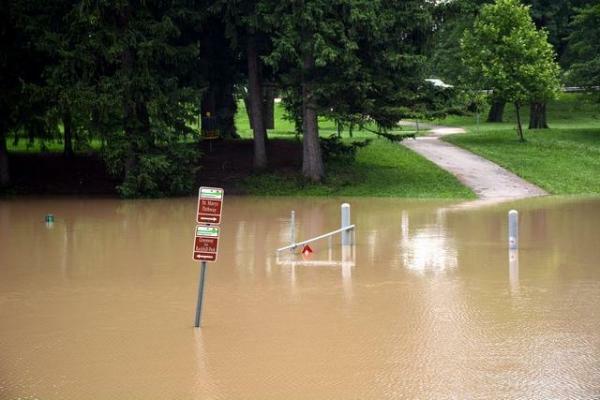 I don’t care to be unprepared and end up broke down and stranded. It is all a weighty matter and some argue that weight matters. Some go to extremes to lighten their trike as much as possible. Some of the things they do to achieve this frighten me. 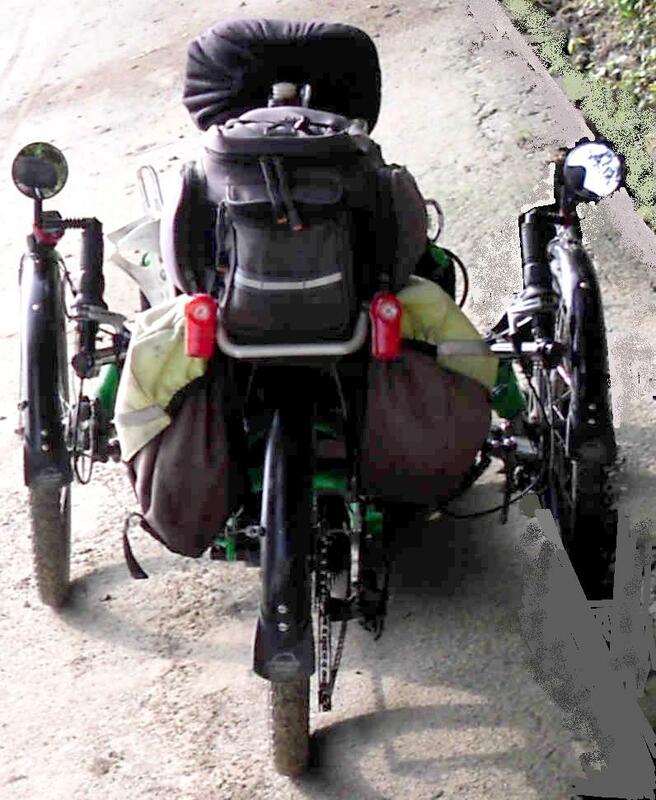 I am talking about things like taking half of the spokes out of the wheels, drilling holes in the frame and other parts of the trike, replacing steel bolts with plastic ones even in critical locations which could be disastrous if they broke, etc. I guess it all comes down to “different strokes for different folks”. I know this … I don’t want to be riding near the person who is dangerously going about reducing the weight of their trike. If they are willing to risk their own life and limb that is one thing, but they could just as easily effect others’ well being. This is all a weighty matter and when it comes to our safety this small amount of weight saved doesn’t matter at all in my book. Tick tick tick … or was it click click click? Hey, I don’t remember. All I know is that near the end of my ride today I started hearing a noise coming from my right front wheel and it seemed to be emitted from my disc brake rotor. I looked it over but didn’t see anything obvious. Upon arriving back home I tore into it. I learned something today which was a costly lesson. I would have and should have spotted the problem much sooner and not only saved myself a lot of work but considerable expense. I say considerable expense because now I need to replace the entire brake caliper assembly. I tore it apart and then discovered that it would not go back together. By the time I did get it back together it was damaged. 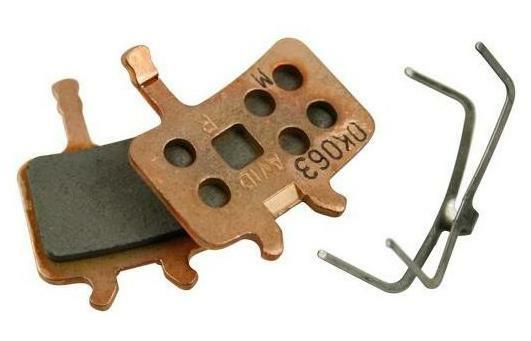 Now I have no adjustment on the inside brake pad. The noise I was hearing was something making physical contact with the holes in the disc brake rotor as it rotated. Looking back on this that should have been quite sufficient for me to have looked for what would make that noise and the most suspect thing would be the brake pad area. Instead of using my head and taking a close look I just simply observed the condition of the brake pads and laid everything aside looking further elsewhere. DUH! If I would have only taken a close look at the spring clip I would have found the problem. I didn’t see it until I was putting everything back together … the very last thing was the brake pads with this spring clip. As embarrassing as this is to share I am doing so to help others. 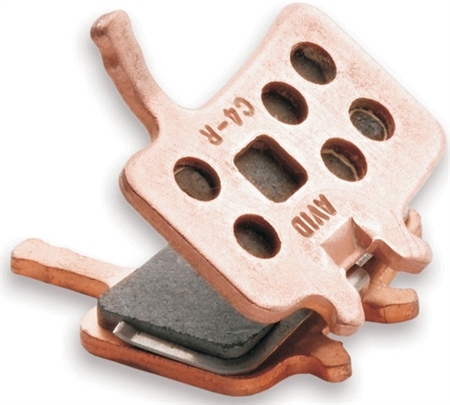 If you hear such a noise coming from your disc brake rotor as your wheel revolves check out the spring clip in the brake pads. It would have been a simple quick inexpensive repair if I had only done so. Yep, that small metal clip somehow got damaged. The one side partially broke off and the rest of it bent back and was what was making contact with the holes in the brake rotor. Tick Tick Tick … all the way home. My brake assembly had been perfectly good. Now I will have to shell out $57 for a new one. I can ride it as is and even have a functioning brake, but it is not right and that bothers me. Besides I have a slight drag on that wheel as the other brake pad has to be adjusted in further to compensate for the side that no longer adjusts. Some trikes come with lumbar support built into the seat while other trikes are simply straight. As a consumer I would be quite willing to pay the extra $10 it would take the manufacturer to put the extra bends in the tubing for the lumbar support. I am sure they would charge a whole lot more than that, but that is about all it would cost them to do it. 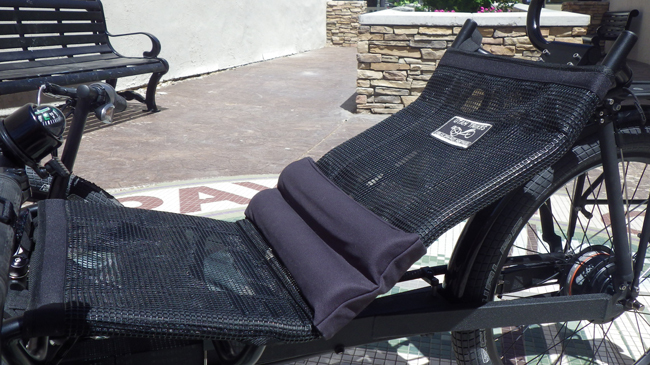 Utah Trikes offers an add on product to provide lumbar support. 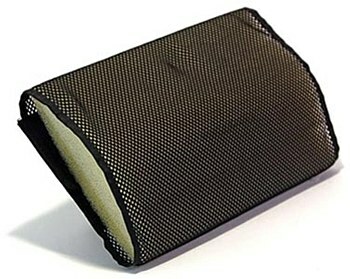 It costs about $30 and can be attached to most mesh seats and adjusted to wherever it is needed to provide the comfort and aid to one’s back. Sometimes it is nice to simply add additional support and some folks need extra help for their backs. Here is this lumbar support added to a TerraTrike that already has built in lumbar support in its seat back. I am not promoting or suggesting the following product shown in this video. I just found it interesting and thought I would share it here. Looking up this product I found the cost varying between $75 and $100. I have no idea if it is suitable for use on a recumbent seat. 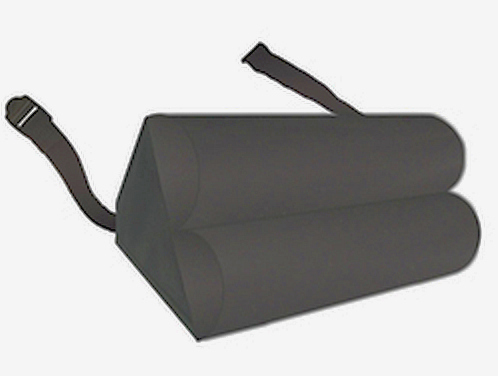 There are other aftermarket lumbar support products available too. TerraTrike offers one for about $35. Varilite offers an inflatable one very similar to what I have. The cost is $60. I have a cushion similar to this which is inflatable so you can adjust the size and effect of it. Mine is orange in color so it stands out … something I would rather it didn’t do. I haven’t used it for years and hadn’t even remembered it until I started writing this article. 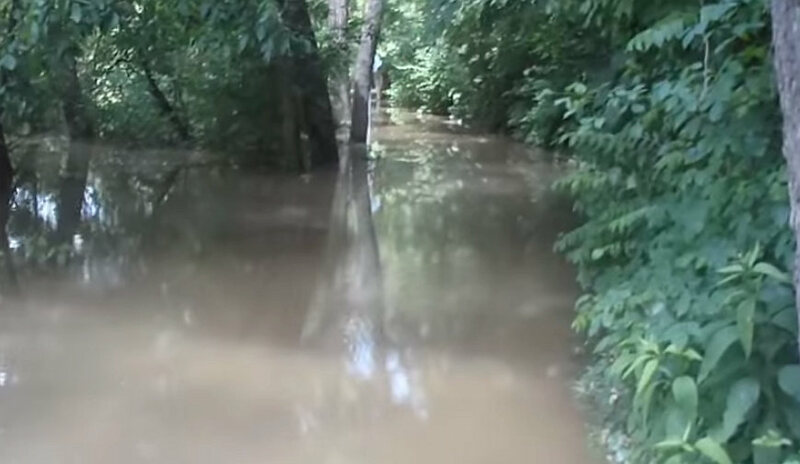 I don’t have any idea where it is. I would have to hunt for it. Maybe I should and give it a try again. I am sure there are yet other available to purchase. And I am quite certain that there are those who have/do/will come up with their own. One thing I want to mention here is that if I were going to add something onto my seat I would not want some sort of a large cushion which would take up precious space forcing my body to sit further forward in the seat. Some trike seats are not very deep to start with so one can’t afford to give up any real estate. ICE seats are quite short … one thing that I don’t like about them. I am going to go out on the proverbial limb once again and say what I am thinking. 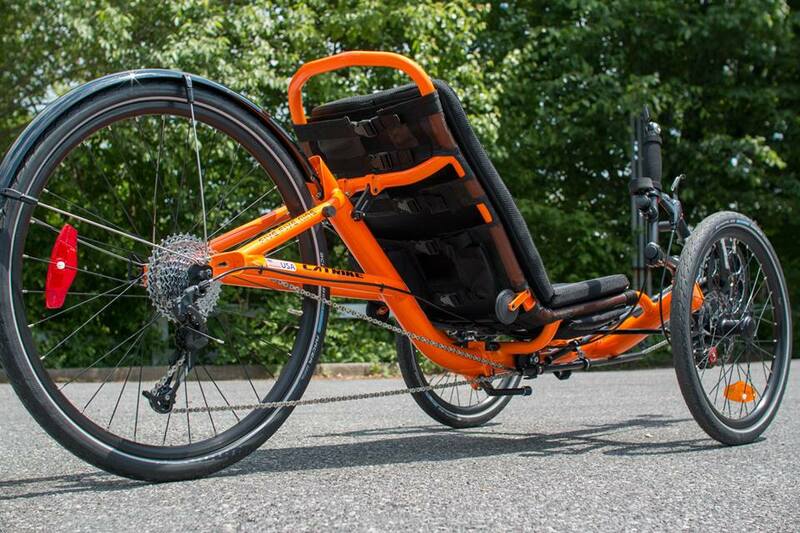 It the lowest cost trikes (Sun) come with lumbar support what is the deal that a company like Catrike only offers it on certain models? In earlier years it was only on more expensive models, but now they are all expensive yet they still don’t offer the lumbar support on some models. My Catrike Trail (2009 & 2013) only have a straight seat back. As I stated earlier it would cost so very little extra during the manufacturing process to put the extra bends in the tubing to provide the lumbar support. To my way of thinking not doing so tells me that the manufacturer doesn’t care about the customer. Our backs are not straight so why do they make a seat that is straight? While out riding today I decided to take a couple of minutes to tighten some of my straps on my mesh seat. In doing so I was reminded of the scenes where a guy was helping a gal cinch up a corset by placing his foot in her lower back and pulling for all he was worth. It hurts just thinking about it. 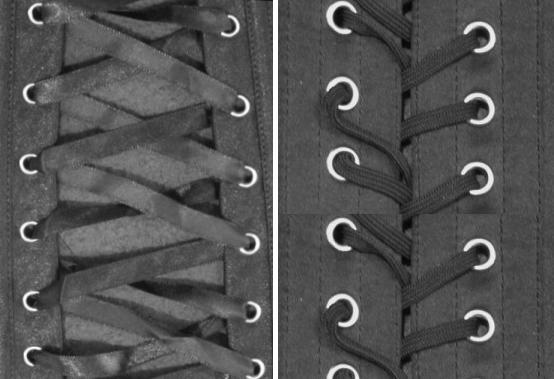 This image below is not a mesh seat, but it should illustrate my point as to loose vs. tight lacing. I only tightened the upper straps on the back. Anyway, in tightening the straps I noticed a considerable difference when I sat back down in the seat. And honestly, I wasn’t sure I liked the difference it made as it seemed too tight. I kept riding it and eventually I got more used to it, but it still seemed a bit too tight. What I am saying is it really did make a difference and we all have our needs and preferences as to how the seat is set up. I would not be surprised if I end up loosening the straps just a wee bit as I think it would make for a more comfortable ride. Pulling the straps tight can be challenging and difficult. Our bodies are all different and what feels good and is right for one person may not be the same for another person … and visa versa. Even mixing up which straps are tightened and which aren’t can be therapeutic. Some people may prefer/need all the straps as tight as they can’t get them while others may prefer/need all of them loose. And some may prefer/need the bottom loose and the back tight or visa versa. Or some other combination may be in order. It is all a matter of personal choice and only we can determine what works for us and what doesn’t. It may take some experimentation … trial and error to get our seats dialed in to the best comfort for us. Although the straps on our mesh seats are pretty strong I would caution you that if you are pretty strong it is possible to break them by pulling too hard. I would also caution you that it is possible to have the straps too loose to the extent that they rub something such as the idler pulley for the chain. This is not only inefficient, but in time it can wear the strap in two. Depending upon what type of idler pulley you have it could even stop it from revolving and thereby allowing the chain to wear out the idler pulley. Keep in mind that the heavier the rider is the more chance there is of the seat strap(s) making contact with the chain/idler pulley(s), especially if the seat straps are loose. update: for now I have decided not to do the new article posting on a regular basis like I was doing (Mon, Wed and Fri). Instead I am going to post new articles whenever I feel like doing so. I have made a notation accordingly where it used to say posting new articles M,W & F. I think this is what I need at this time. It frees me up and takes the pressure off of trying to come up with new postings so frequently. I will just have to see how things go. Thanks for bearing with me thru this. If you have never seen this video before I think you will find it interesting. Unfortunately it doesn’t work to just ride a trike and never do any preventative maintenance. Sooner or later problems will arise. Components require cleaning and lubrication or they will not perform properly and wear out prematurely. A rear derailleur is a rather amazing device which when everything is set up proper and in good condition will operate flawlessly. It can also give you fits when it isn’t up to snuff. It is important to keep it clean and properly lubricated. 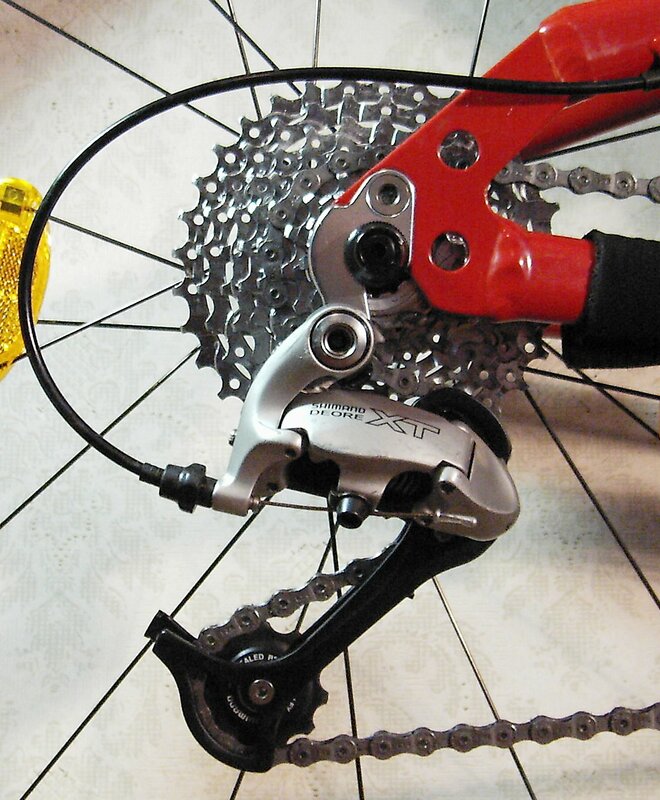 Here is a video on how to clean and lubricate the rear derailleur of a bike. In the process, it also demonstrates how to use products from Finish Line Technologies, Inc., including the Brush Set, Speed Clean Speed Degreaser, Teflon Dry Lube, and Extreme Fluoro Grease. The video consists of four parts, how to clean derailleur pulleys, how to brush off a derailleur, how to spray it down and dry it off, and how to apply lube to it. In fact, I suggest getting one of these pumps even if you do have an air compressor available to use as they are quite handy and practical. I have a couple of air compressors, but I find the floor pump to be a God-send. Most good quality pumps nowadays have a built in gauge making it very handy. I suggest checking the accuracy of the gauge initially and from time to time to be sure you are getting the right pressure in the tires. A good quality air floor pump can be purchased at your local bike shop or online. I would also suggest that you talk to a local bike shop mechanic to get their recommendation as to what pump to buy. You could also research them online to get customer feedback. Here are a couple of examples of pumps available. These are both rather expensive pumps, but one is rated high and the other is rated low. So you can’t always go by the price or even the name brand. In this particular case the one which costs the most is the one with the bad reviews. One can buy a decent quality air floor pump for as little as $25, but I highly recommend you do your homework first to know what customers have to say about the pump you are considering. 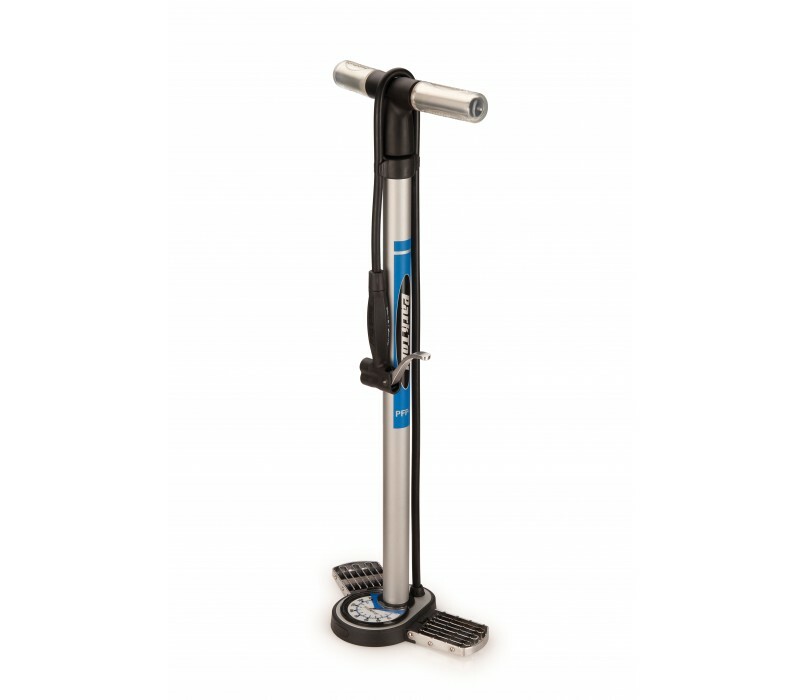 Blackburn Air Tower 3 bike floor pump retails for about $50. It is rated at 160 psi. I found it for $37.50 online. Park Tools PFP-7 Professional Mechanic floor pump retails for about $62. As expensive as it is this pump is poorly rated. That is surprising since normally ParkTools usually has pretty good quality products. One of the biggest customer complaints about the ParkTool pump is the head. I am not making any recommendations as to what pump to buy. I am only showing these two as examples of what is available. There are lots of different ones out there. I myself have a Pedros Domestique Home Mechanic floor pump I got from a local bike store. It has been a very good pump over the years I have had it. It is rated at 120 psi. Bikebing.com lists it for about $30. And Amazon lists it at about $26 with shipping. The reviews of it are rather poor, but from what I have read the complaint against it has to do with using it on Presta valves. I wouldn’t wish Presta valves on my worst enemy as they say so for me using it on Schrader valves it has been great. I am not trying to proclaim it as a superior quality pump, but for my uses I have no complaints whatsoever. Most pumps nowadays have a dual head on them so that either Presta or Schrader valves are accommodated. Some of these heads are designed and made better than others. Those who test these pumps and report on them say that the biggest problem they have found among pumps is the head. As stated … some are better than others. Some work great and without leakage while others are somewhat difficult to use and leak. The ParkTool pump’s head blew off twice during testing. HERE is an article about floor pumps and their recommendation as to the best pump for the money. The other pump they recommend as do several other reports is the Nashbar Earl Grey. Actually it was their first choice, but since it is not currently available they have the Lezyne pump as their top choice. The Nashbar retails for about $50. Nashbar reports that it is presently out of stock, but can be ordered and they will ship it when it becomes available. I have seen this pump listed for about $30 so it can be purchased at a great price when available. Some pumps come with a relatively short warranty while some come with a lifetime warranty. 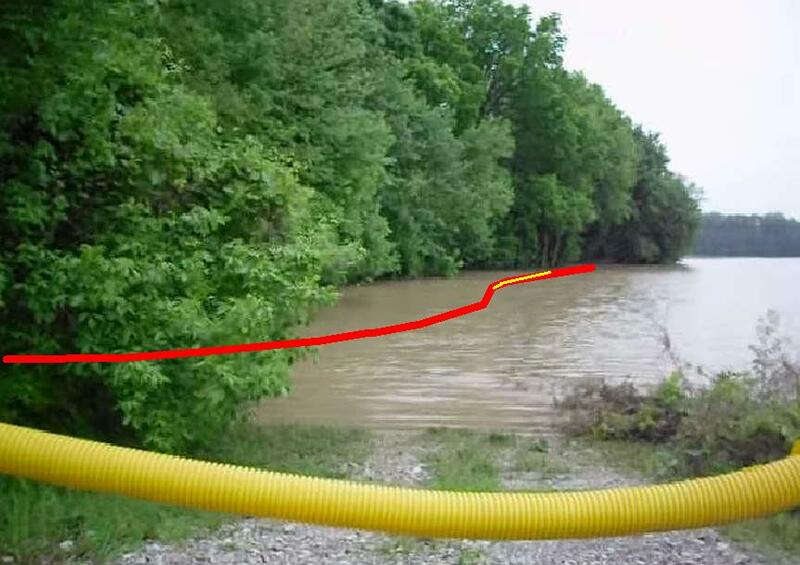 A long hose is a practical feature as is a good solid base so that the pump isn’t wobbly. A large diameter and easy to read gauge is also a welcome feature. I like the type of guage which have an adjustable line or arrow/pointer you can rotate to the pressure you want to pump up to. This makes it easy to see when you have reached that pressure level. 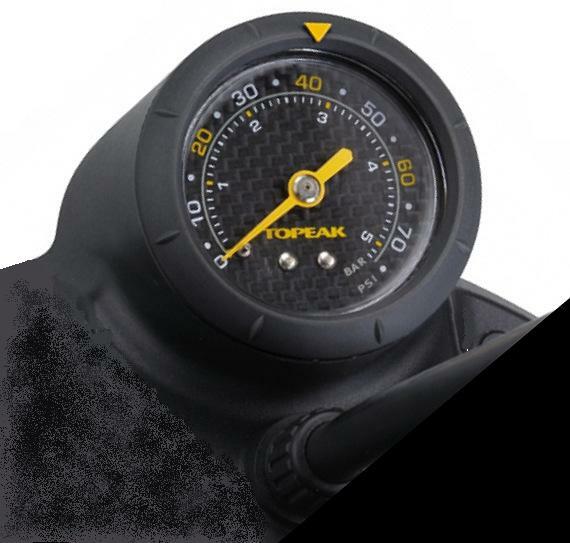 The image above shows this adjustable part on top of the gauge quite well. I chose the image for this purpose even though this is not a high pressure pump. As you can see it only goes up to about 75 psi. In case you didn’t know it, an innertube loses air on a continual basis so it is necessary to inflate them from time to time. That’s right … air leaks right thru the rubber so they are constantly losing pressure. Some seem to leak worse than others and deflate quicker. It is important to keep your tires inflated to the correct pressure. You will get better wear and mileage out of your tires as well as make it easier to pedal along since low air pressure equates to more rolling resistance. Also handling is best when the tires are inflated to maximum pressure. 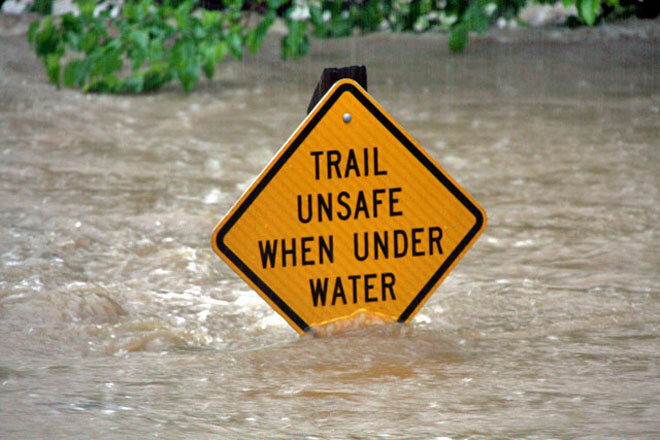 It is also important that you never over inflate your tires beyond what they are designed for. 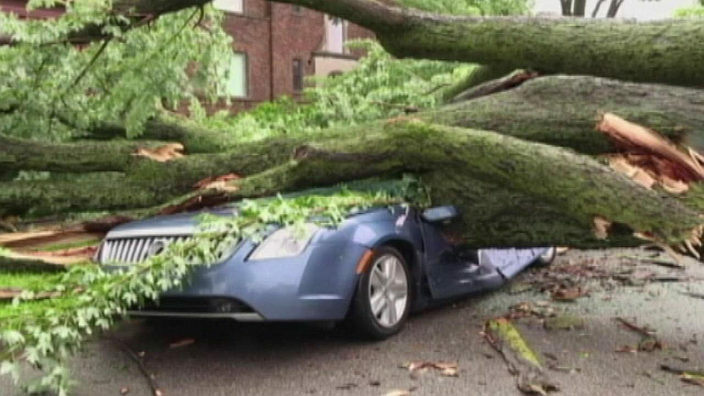 Doing so can result in destroying the tire and causing a major tire failure which could be disastrous at worst and leave you stranded at best. I once put about 10 psi more in a knobby tire I used for winter riding. About 10 miles from home I noticed something which wasn’t right as I rode along … a pronounced thump of sorts. I stopped and got off to look. My rear tire was literally coming apart … separating from too much pressure in it. Fortunately I was only about a half of a mile or so from a local bike shop so I made it over there and got a new tire. The tire that had just gone bad would have lasted me for several years more if I had not over inflated it. The chain is often the most neglected and abused part of a human powered cycle and yet it is one of the most important parts as without it “you ain’t goin’ nowhere”. It is important to keep it clean and properly lubricated so that maximum wear, life and dependability will result. Also it will help facilitate proper shifting and pedaling efficiency. 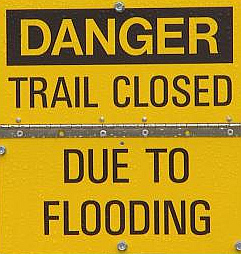 Failure to properly maintain the chain will result in premature wear and need of replacement. 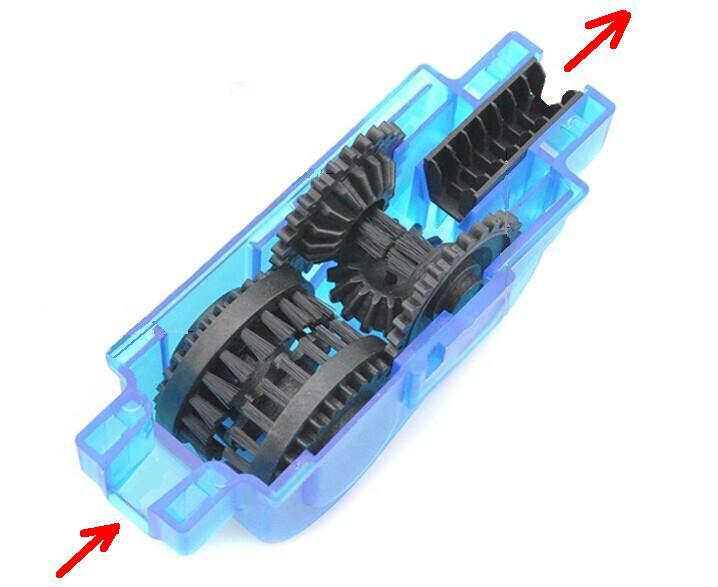 And that wear and replacement might very well involve the various sprockets as well as a worn chain will wear out the sprockets prematurely. It can all get quite expensive. Keep in mind that on a tadpole trike the chain is 2.5 to 3 times the length of a typical bicycle chain. So when it comes time to replace the chain it is going to cost 2.5 to 3 times as much as it would if you were replacing the chain on a DF (diamond frame) bicycle. 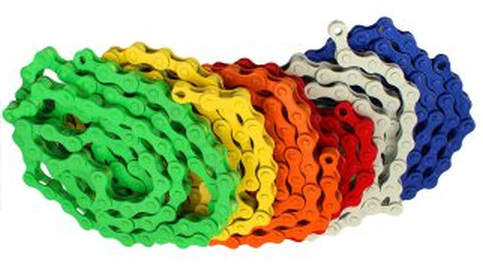 The video below explains the importance of and how to clean a chain. Again, keep in mind this mechanic is talking about a DF bicycle so when he says 119 links you must multiply that by 2.5 to 3 times for a tadpole trike. If I remember correctly my trike requires about 263 links and I am rather short so someone who is tall would probably have on up around 300 or more links. Also when this mechanic speaks of a chain increasing in length by 2 inches on a DF bike on a tadpole trike a worn chain could increase considerably more than that because of all the additional links involved. 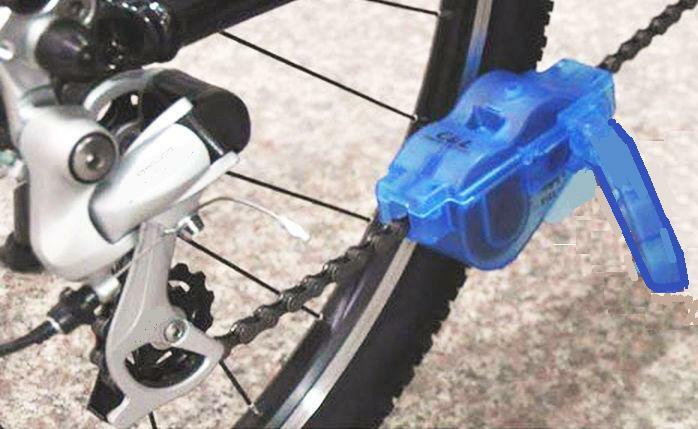 These chain cleaning devices are pretty nifty and make the job of cleaning a chain a lot easier and faster than the way one would go about it without such a device. They also make the job a whole lot less messy. There are several different brands and models on the market. I will state upfront that they are not all created equal. Some are better than others in their design and their quality. Sometimes a cheaper one seems to perform better than a more expensive one, but that isn’t always true so don’t go out looking for the lowest priced one you can find thinking that it will be superior to a much higher priced one. I suggest doing your homework and research into this. Unfortunately I can’t give you any guidance on this as I have only been around two of them. One was a brand name and the other was not. The brand name one cost considerably more, but it didn’t work as well and didn’t hold up as well as the cheaper one. You can pay as much as around $50 for one of these. Here is a look inside of one of these chain cleaning devices. Amazon.com sells these “machines” as cheap as $3.85 with free shipping. It it pictured above. It is currently shown as “out of stock”. At that price I would imagine that they sell a lot of them. There is a bunch of different ones available … that’s for sure. I won’t argue that removal of a chain and the use of perhaps an untrasonic cleaning device is the best way to clean a chain. Even hand brushing might do a better job than using one of these cleaning machines as long as the person doing it does a proper and thorough job. 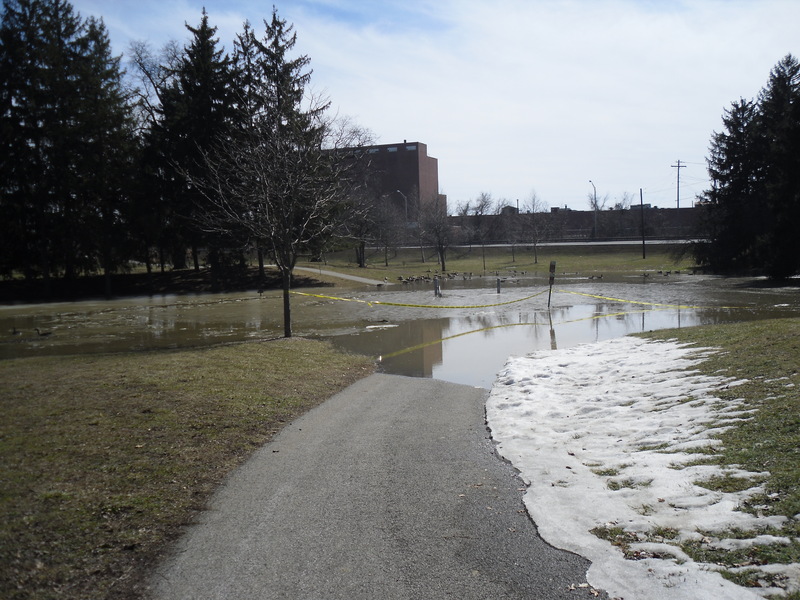 However, certainly the idea of cleaning a chain on the trike is appealing as removing and reinstalling a chain of a tadpole trike is something to be avoided if possible. It can be a real pain of a task to get involved in compared to doing it on a DF bicycle. I have used a couple of these chain cleaners before and thought they did a pretty decent job … enough so that I think I would most definitely prefer using one than doing it manually the “old way”. Here is another video showing the use of one of these cleaning devices and instructing about how to relubricate a chain after it has been cleaned. One thing about using one of these chain cleaning devices on a tadpole trike is the fact that the pedals are located a far distance from the rear derailleur where this device is normally used as pictured both above and below. This makes it rather difficult for an individual to use the device by him/her self as one can’t normally reach that far. So if the device could be placed up nearer to the pedals it would make the task easier. However, most trikes have plastic chain tubes up there which would prevent the cleaning device from being placed up there. Another person could be used to accomplish this, but having used a couple of these myself I would have to say that it works best for the person holding the cleaning device to also be turning the pedals as it is important that the person turning the pedals is “in tune” and has “a feel” of what is going on with the chain as it passes thru the cleaning device. If something were to go wrong the 2nd person doing the pedaling might not stop pedaling if and when the need arises and the result could be a bit disastrous. So my advice would be if you are using the service of a second person be sure you are both paying attention and they are prepared to stop pedaling instantly should the need arise. I am probably making more out of this than necessary and unduly alarming folks. Chances are things would go quite well and nothing would be challenging. I just know that things can go wrong and want to make you aware of it. There is at least a couple of model designs which attach to the rear derailleur which might be helpful on a tadpole trike application since it is so difficult to impossible for one person to turn the pedals and reach the rear derailleur area. To use this the trike’s rear wheel would have to be off of the ground. 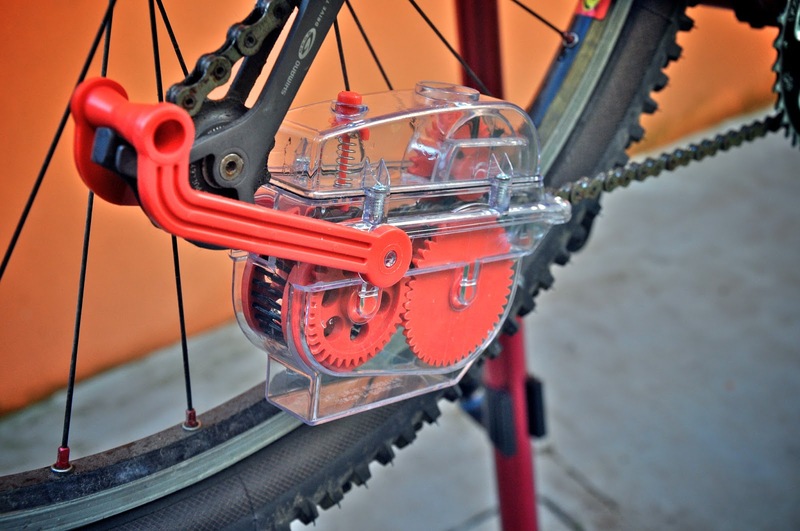 The well known and respected bicycle tool manufacturer, Pedros, makes a chain cleaner they call the ChainPig. It too is a hands free type. It uses a very small amount of degreaser solution. It retails for $28, but can be found cheaper at times. Right now the best price I can find is $22.34 with shipping on Ebay. HERE is a review article on the ChainPig. 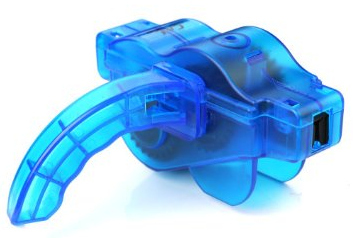 They are very impressed with it … more so than any other chain cleaner device they have tried. When it comes to lubricating the chain there exists some new innovation on the market. Check out this nifty designed lubricant bottle and application device. There are a few companies offering this same designed application bottle. I don’t know how well it works so by featuring it here I am not promoting it. Now that I have written this article I feel strongly convicted. My chain needs to be cleaned. And I don’t currently have a chain cleaning device. I have been putting off getting one. I guess I will have to go do my homework, but right now without doing any more research I have to admit I am drawn to a certain little critter. Here Piggy Piggy! 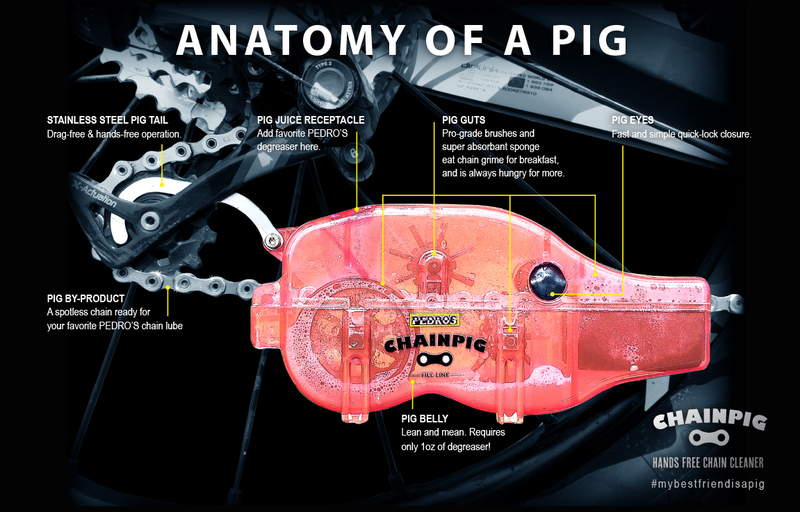 Update: I ordered the Pedros ChainPig the same day I wrote this article. It came in the mail today and I just used it for the first time. I love it. I was extremely impressed. It is so easy to use and did a great job cleaning my chain. It made the chain look like brand new. Yep, it is the cat’s meow! The hands free feature worked great and really makes the difference since I can’t reach the pedals and the chain cleaning device at the same time. 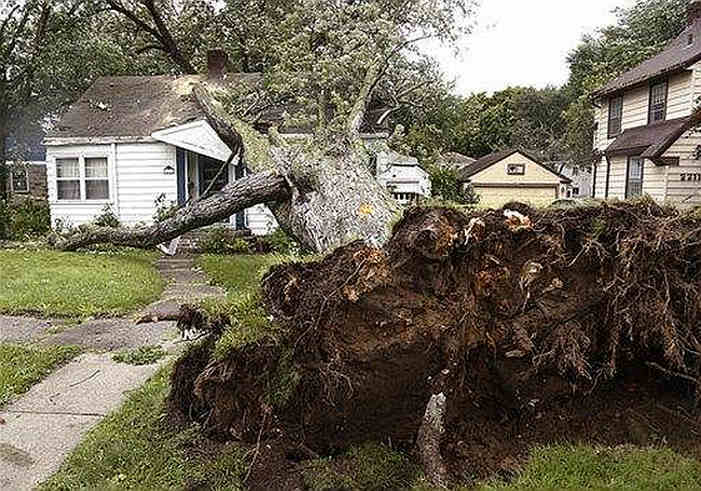 It is one little piggy that is going to stay home (vs. going to the market). I loaned it to a friend to try and he also thought it worked really great. He ordered one right away. The only thing I can say is that if you use it (or any other brand/model) while the trike is sitting down on the ground it is hard to do. I definitely advice getting the trike up on some sort of a workstand/table. Since you pedal backwards the rear tire doesn’t need to be elevated into the air. 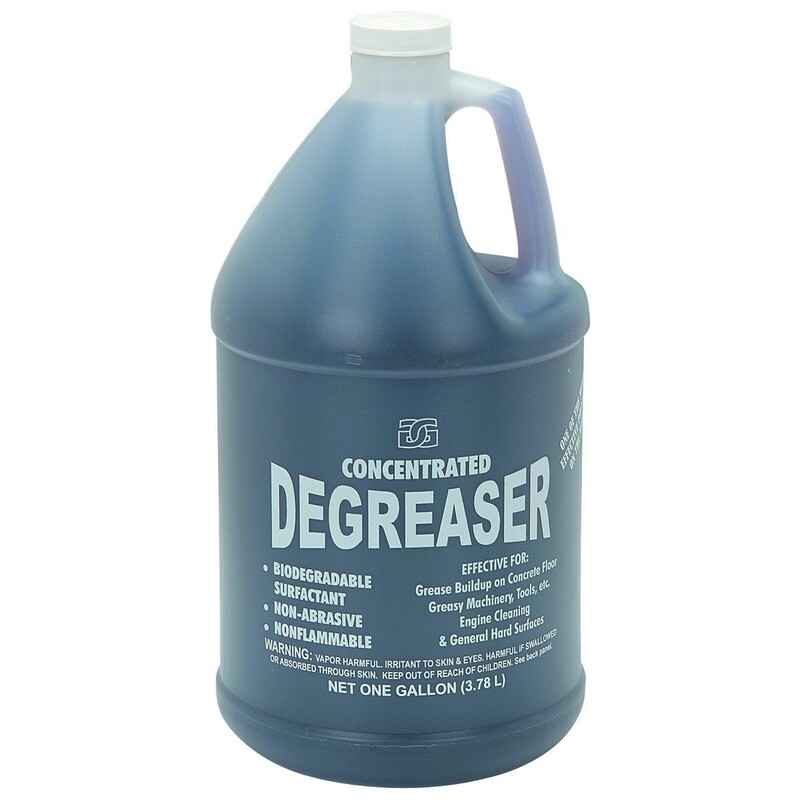 As to degreasers, there are several choices. I use one I bought at Harbor Freight. It is not only inexpensive, but it works great. It is a concentrate intended to be diluted with water, but I use it full strength. It comes in a gallon jug and sells for $6.99.